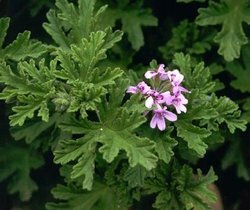 Common Name : Rose Geranium, Geranium Oil, Sweet Scented Geranium. Habitat : Cultivated in india. Uses : Geranium oil is aromatic, anti-inflammatory, antiseptic, astringent, balancing, calming, distressing, harmonizing, refreshing sweet and sedative. It is helpful in relieving tension, eczema, dermatitis, anxiety, premenstrual and menopausal problems, circulation, nausea, tonsils, flu, burns, rheumatism, nervousness, stress and fatigue. Geranium oil utilizes in perfumery, cosmetics and food industry. It is used as herbal tea. It also possesses insect repellent properties. On the skin, oil helps to balance the secretion of sebum and clears sluggish and oily skins, while the antiseptic and cicatrisant properties make this oil an effective aid to help with burns, wounds, ulcers and other skin problems. It is useful for treating jaundice, gall stones and can also be used for restraining nose bleeds and other hemorrhages.